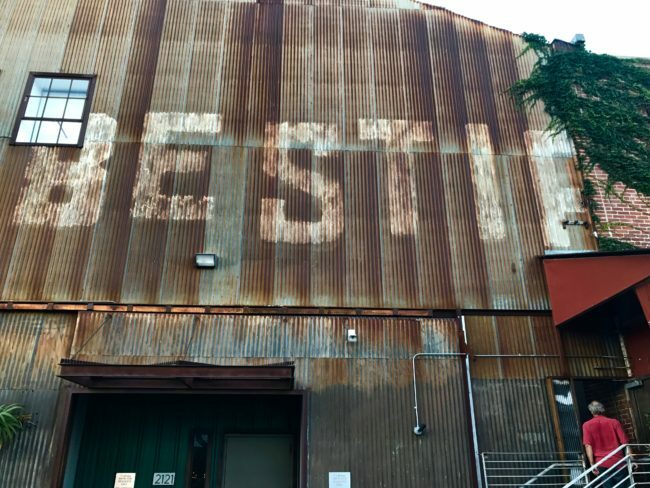 After waiting nearly a year to secure reservations at Bestia located in the Arts District in Downtown Los Angeles, Tracy, Susan and I arrived for dinner on a Monday evening at 5:45 p.m. 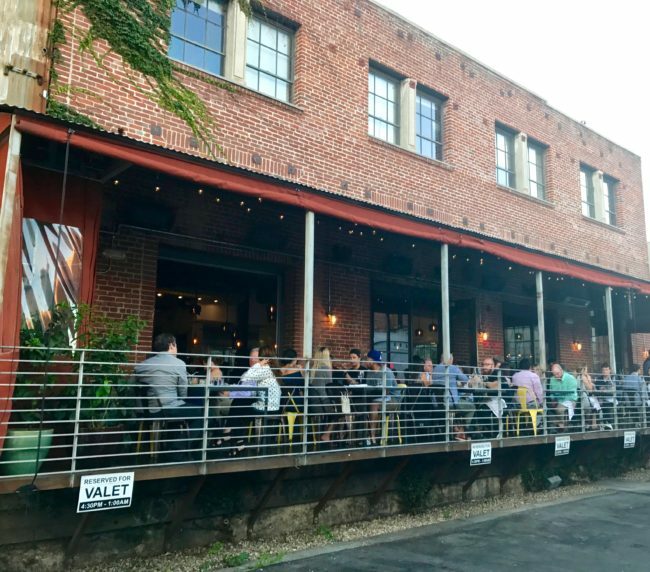 Yes, you read that correctly, it took us almost a year to score a relatively conveniently timed reservation…before 6 p.m….on a Monday night…on Fourth of July Eve. And I thought getting Hamilton tickets was tough. Several of our friends had already been to Bestia, two of them waiting in line before the restaurant opened at 5 p.m., and another scoring a reservation during Dine L.A. Week. Reservations open up three months in advance (and they go quickly), and to be fair I could never set up a time that was convenient, since the times were either way too early or way to late when I would get on their website. 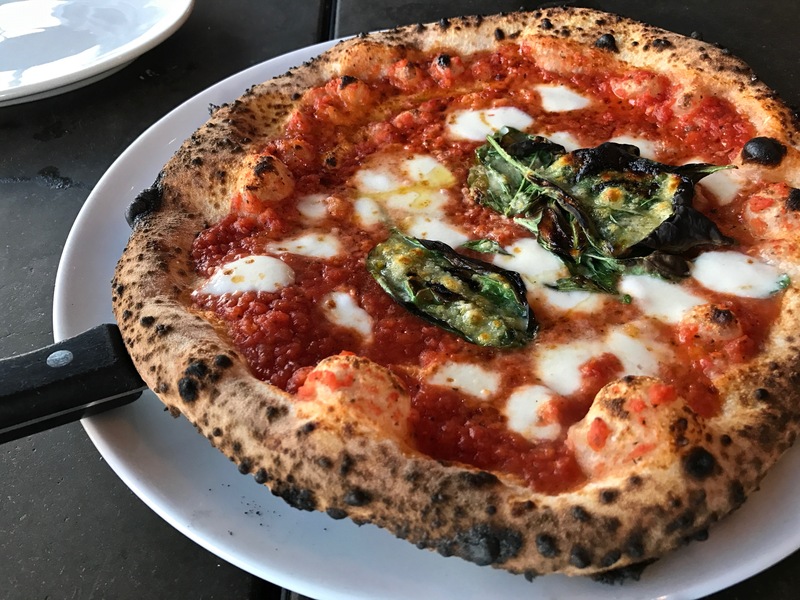 There are plenty of fabulous Italian restaurants near Downtown Los Angeles these days. 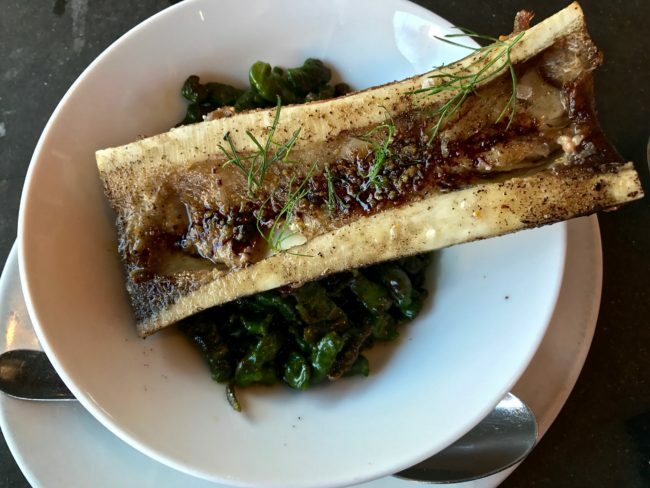 We recently dined at Silver Lake’s Alimento and were so blown away we dined there twice. 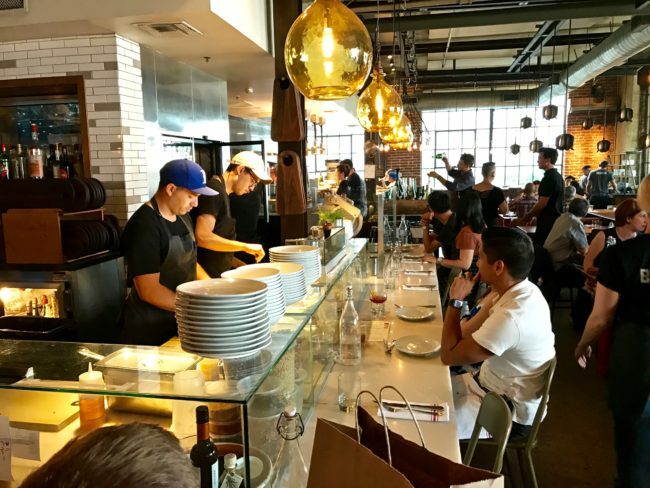 Officine Brera was our choice for MaiTaiTom’s 2016 Restaurant of the Year and its sister restaurant, The Factory Kitchen, won in 2014. But we were definitely looking forward to trying the cuisine at this restaurant to see what all the hoopla was about. 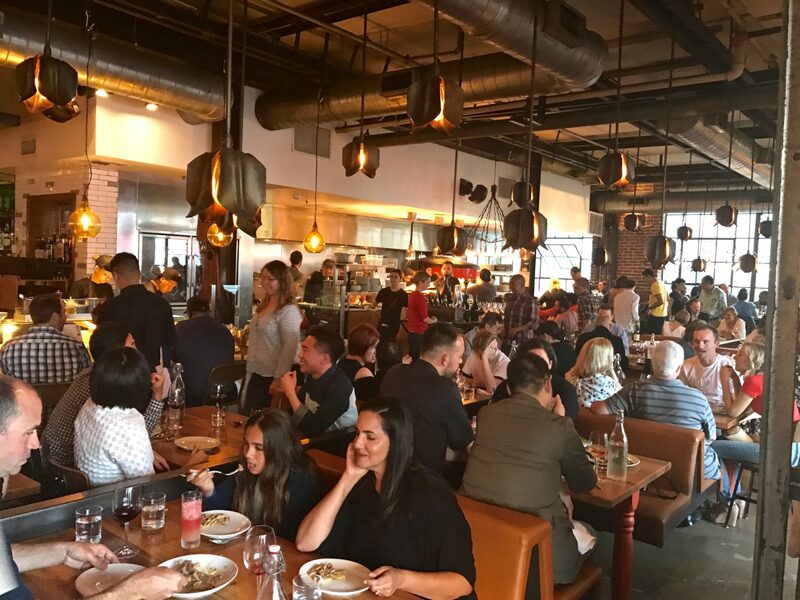 Accolades galore have been heaped on Bestia in numerous local and national publications, some proclaiming it the best restaurant in Los Angeles and even one of the best restaurants in the U.S. High honors indeed. 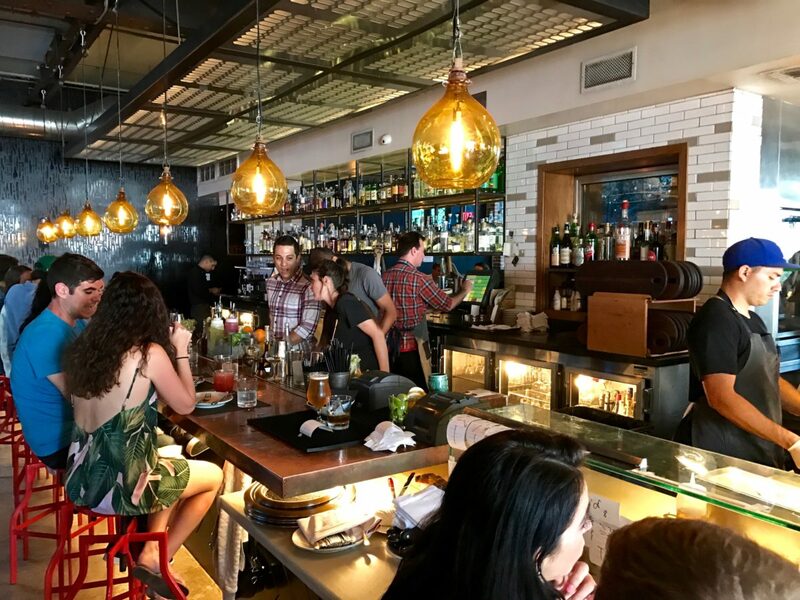 Our friends’ reviews were considerably more mixed, which is why we felt inclined to dine here, no matter how hard it was to get a reservation. We arrived at 5:30 p.m. and the place was already full to the brim (many of them millennials…when I was their age I could barely afford Arby’s). The couple in front of us arrived without reservations and were quickly turned away. Since it was a nice, breezy evening, we asked to be seated on the terrace which was a good idea as the sound level inside, as with most restaurants these days, was deafening (I mean really loud). There are also a few tables just outside the entrance to the restaurant squeezed in the space between the buildings. If you want to carry on a conversation with your companions, I highly recommend you reserve a table on the patio. The entire wait staff from the bus boy, who kept our water glasses full without asking, to the server who brought our food were friendly and professional. Our main waiter was a tad aloof, but he steered us away from ordering two similar items. As is the trend these days, the dishes are best shared. Armed with that knowledge and recommendations from friends, we ordered cocktails and plunged in. Susan and Tracy started with a Perzaai; Aperol, amaro, lemon, Prosecco, orange oil, served in a champagne coupe glass ($13). 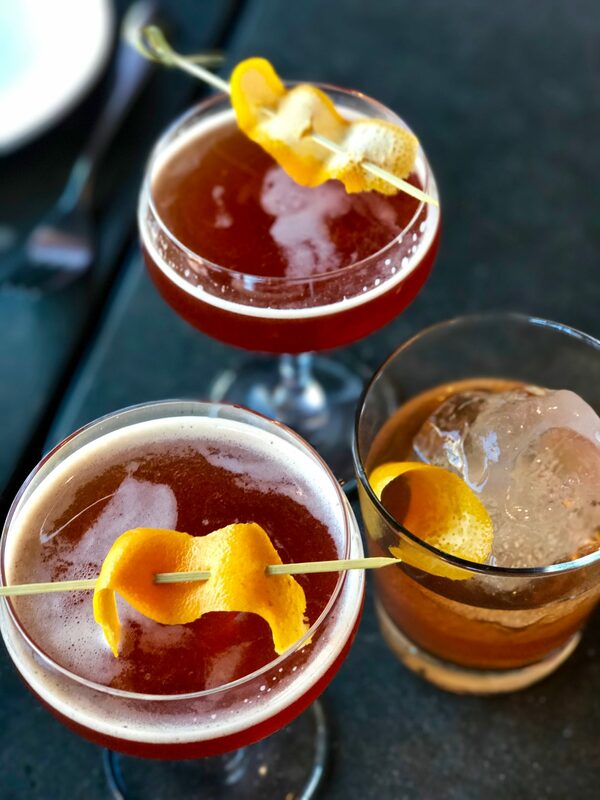 I ordered the Chef’s Old Fashioned, applewood smoked lardo (which coincidentally is my nickname after eating meals like tonight’s) infused bacon, angostura bitters, salt tincture ($16). This was served over a big ice rock, and they weren’t kidding. It was the biggest piece of ice I’ve seen since watching Titanic. The ice cube made the drink seem like it had much more fluid than it did, and at 16 bucks I wanted more fluid. Roasted Marrow Bone on a bed of spinach gnocchetti with crispy breadcrumbs. aged balsamic ($19) was quite tasty. We made no bones about liking it. 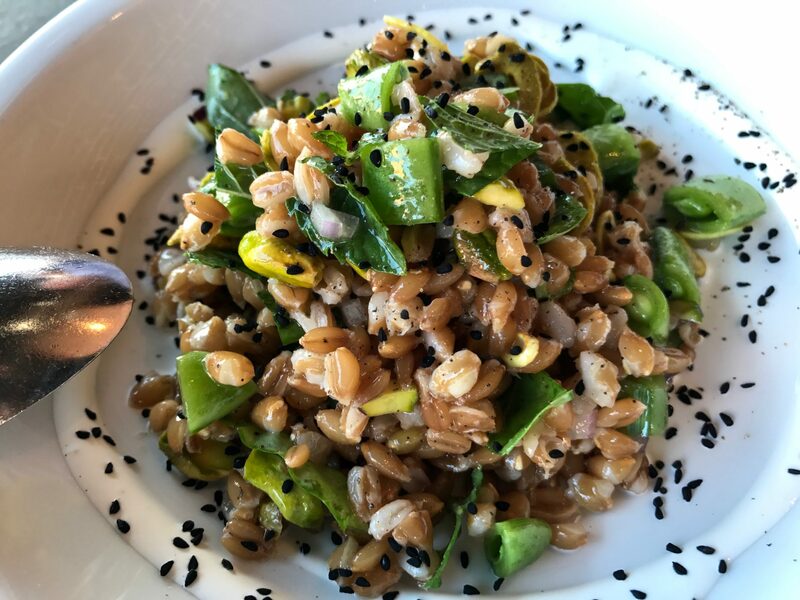 We all enjoyed the Farro Salad; crème fraiche, snap peas, pistachio, basil, mint, pickled sunchoke ($13). It was very good, but not quite as good as the one I had tasted at Alimento a couple of weeks earlier. For a dish I had never tried until the previous month, I was becoming a sophisticated Farro Salad aficionado. Mamma Mia…Farro! 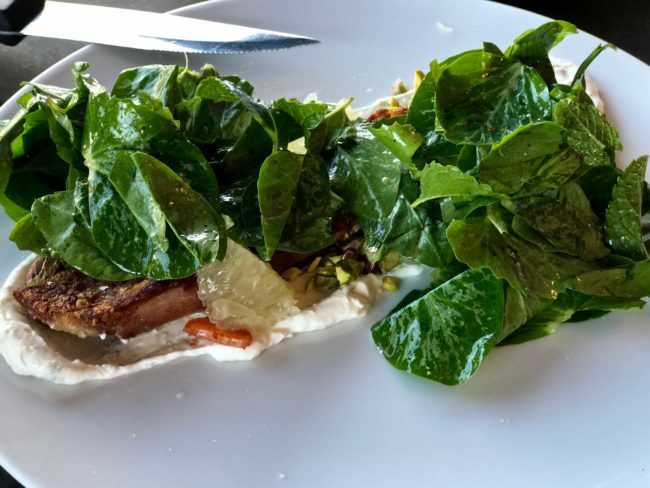 The Lamb Belly alla Plancha; yogurt, lime zest, oro blanco, pea tendrils, pistachio, mint and chili-pickled shallots ($17) was a good sized piece of lamb, nicely crunchy but the real star of the dish was the chili-pickled shallots. A dish of those to munch on with a cocktail (without a giant ice cube) would be a nice combo. Despite being advised by a friend to forego the pizza and go straight to the pasta, we ordered the Margherita pizza; San Marzano tomatoes, mozzarella, basil, olive oil, sea salt ($17). About all I can say about this pizza was it had nice char on it. It was soggy, bland and a real disappointment. However, it did photograph well. Next up, pasta. We ordered two from this section, one on a friend’s recommendation and the other on the recommendation of our waiter. 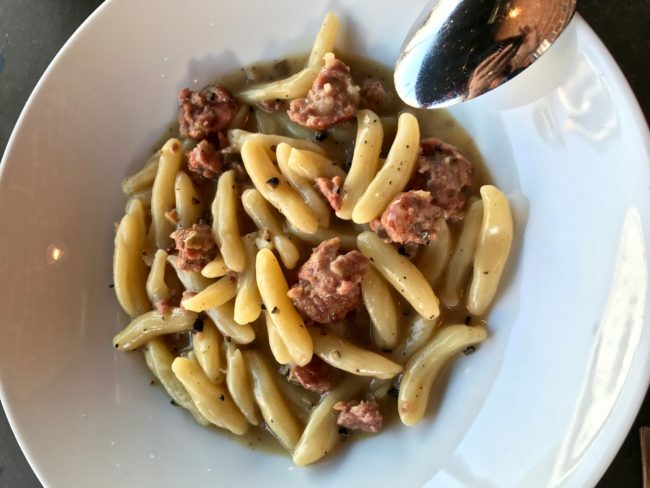 The Cavatelli alla Norcin; Ricotta dumplings, housemade pork sausage, black truffles, Grana Padano ($29) was delicious. 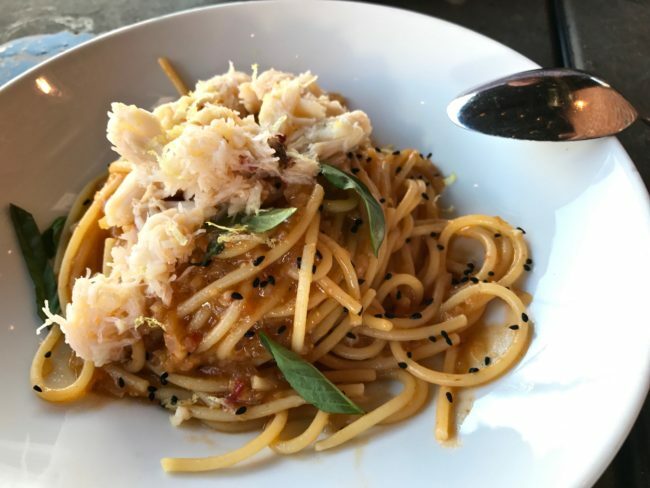 The Spaghetti Rustichella (Dungeness crab, citrus, Calabrian chili, Thai basil, onion seed; ($29) surprised me (in a good way) since I’m not a huge crab fan. We decided to forego the Secondi section of the menu and head straight to dessert (shocking). However, if you are interested, the Secondi section on this evening featured branzino ($36); roasted lamb neck ($26); grilled pork tomahawk chop ($75); and 32-oz. bone-in dry aged prime ribeye ($130). We were hoping to see the pork tomahawk chop or the ribeye go by, but the only dish from this section that we saw was the branzino which was a rather large fish with its head on. On to the Dolci! It was hard to choose. A friend advised us not to miss the coffee and donuts but it was not on the menu on this evening. The Maple Ricotta Fritters; maple butter ganache, sour cream and huckleberry jam ice cream ($12) and Frozen Strawberry Torte (butter cake, strawberry buttermilk, strawberry sorbet, dulce de leche ($12) at the table next to us were very tempting. Tracy could even smell the Strawberry Torte from where we sat. 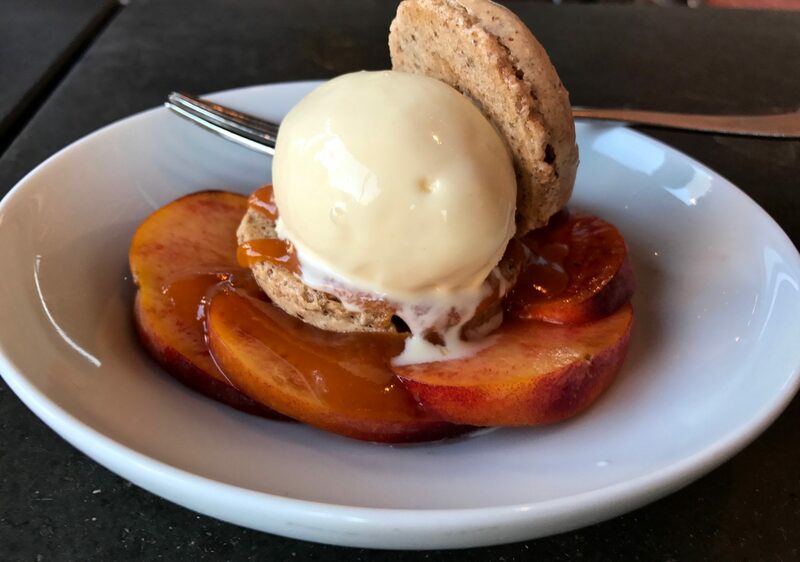 …and Peaches & Cream; sweet cream ice cream, cinnamon pecan macaron, roasted apricot caramel, clotted cream ($12). These desserts were spectacular. 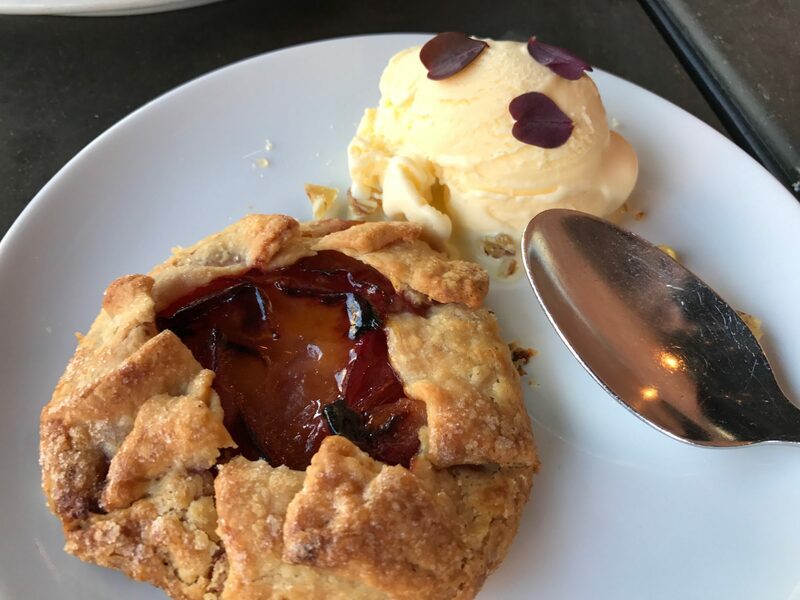 Pastry chef and co-owner of Bestia (with husband and chef Ori Menashe) Genevieve Gergis should be commended for these remarkable dishes. 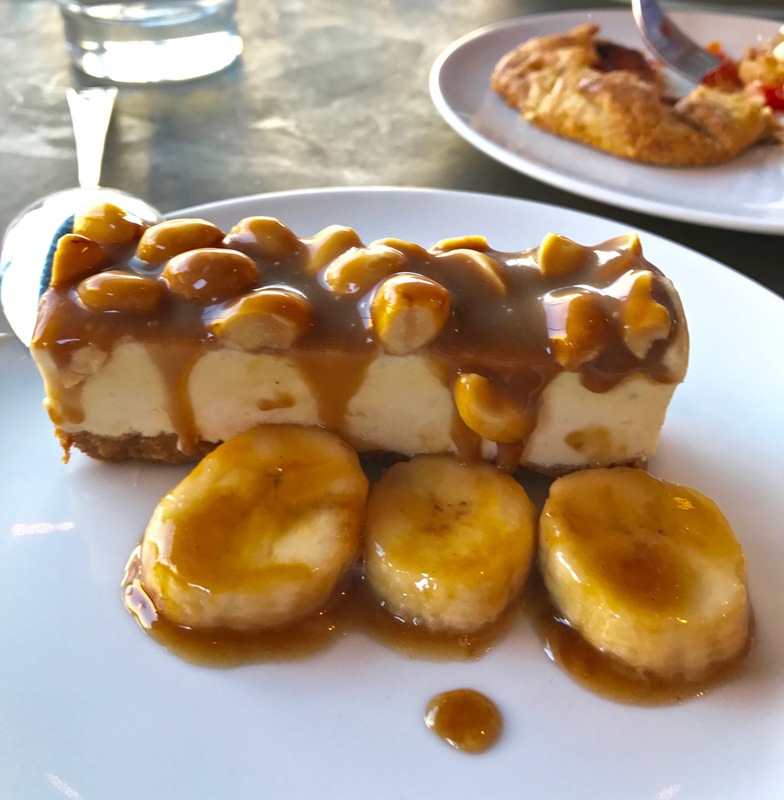 The Roasted Banana Malt and Muscovado Peanut Ice Cream Bar even earned the coveted “Wow!” from our group. The ice creams were great, the crust on the crostata delicious and the cinnamon pecan macaron marvelous. Be sure to save room for lots of dessert! We considered ordering more, but we could barely fit in our clothes as it was. Lardo indeed! On to the bill. Apparently charging for filtered water and donating the proceeds to charity is a new DTLA trend as this is the second restaurant where we have seen this charge. 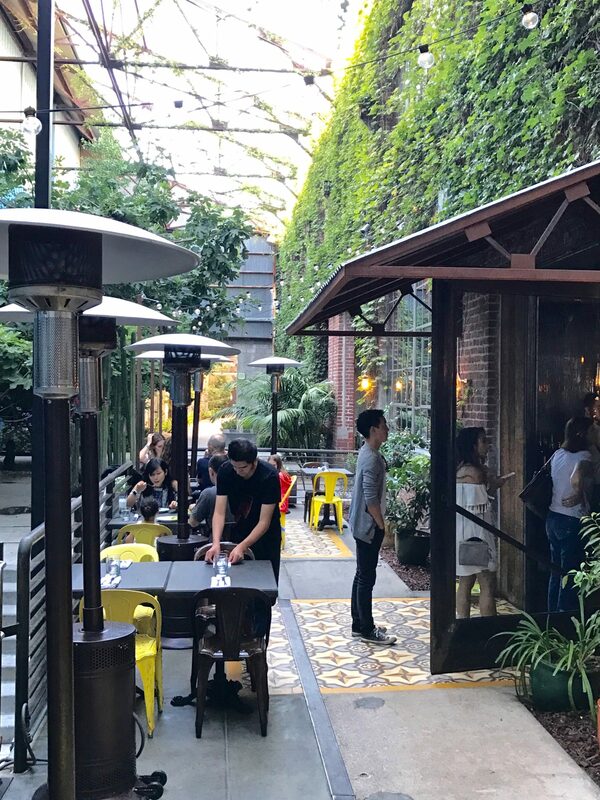 Bestia charges $1 per person for filtered water with proceeds going to Gettlove, a non-profit dedicated to ending homelessness. 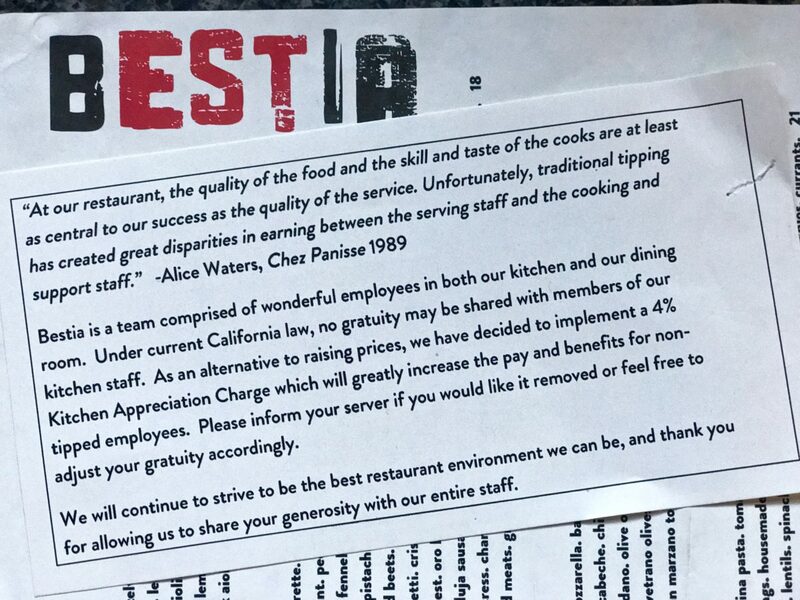 A 4% Kitchen Appreciation Fee was noted in small print at the bottom of the menu and an explanation accompanies the bill. I appreciate the kitchen, that is why we are here, but shouldn’t the kitchen be appreciated by the owner? A 4% Kitchen Appreciation Fee and 20% tip? 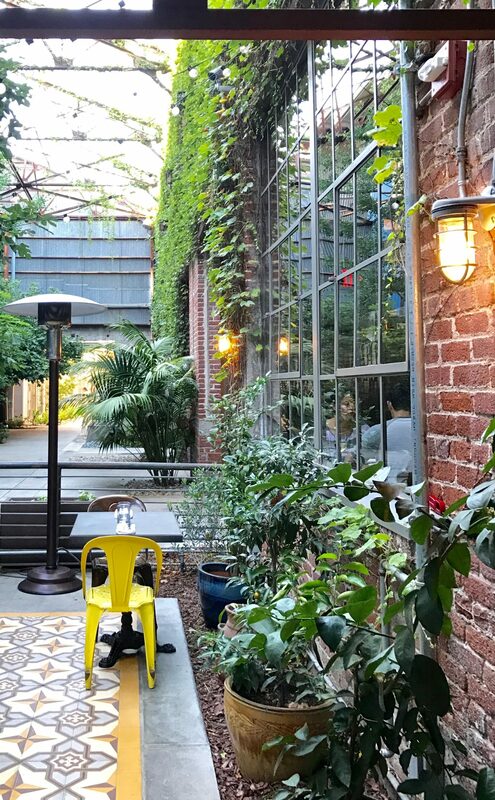 Eating out in DTLA is more expensive than ever. Overall, while we did certainly enjoy our meal, and the desserts were phenomenal, the price point was too much for us. I though the portions a bit small for what we paid, too. So, do I think you should you go to Bestia if you have the opportunity? If you don’t mind the price…yes, you will enjoy the food and the experience. But as mentioned previously, fabulous Italian restaurants abound in L.A. these days…many at a better price point.